Hi everyone! I’m back again and this time I got to meet and shoot with Monami Frost! She brought her wonderful family with her and we hung out at my friend’s home in Studio City. Lucky for us, Moose Limited provided us with a ton of clothes to shoot so we hung out and got some amazing photos! If you want to see ALL the photos from this shoot, download my new app to check out the exclusive gallery. See you guys again soon with more photos of another babe! Alysha Nett: Hi Monami! Thank you for shooting with me. How has your trip to California been so far? Monami Frost: Thank you so much for shooting me. It has been incredible. We are having so much fun. There are so many things to do out here. The best part of it is that everyday I wake up and the sun is shining! My daughter is absolutely loving out here. We are going to Disney and Universal and having the time of our life. Alysha Nett: It was great meeting your family. Was this your daughter’s first big trip? Monami Frost: Yes, it actually was the first big trip for all of us. We usually just work and work nonstop. We love it tho haha. But there’s not a lot of places to go in England so all we do is just work. And then when we go somewhere in Europe it’s usually work related. But we do have at least one day to maybe hang out all of us together when we are out there. Alysha Nett: So this is just a mega trip compensating a few years of working and not going on vacations.What is it like being a young, cool, tattooed mom? Monami Frost: It is actually the best thing in the world. At first when I was 15 and had my daughter I was judged a lot and I thought it’s going to be hard, and it was. But at the same time it was such an amazing experience. I see it as turning a bad situation in to good and finding the best and focusing on the best. Now I love that I am still so young and my daughter is here already with me and we can both build our life together and enjoy it. She is my best friend. People still judge me obviously about being a tattooed mother, but I don’t get offended, cause the only thing that matters the truth and love. It’s just a little sad that people in this world are so closed minded and blinded by some stereotypes or perception of whats normal. Alysha Nett: What would you say is the hardest thing about being a mother? Monami Frost: Constantly worrying that you are not doing the best job and realizing that my daughter is growing up so fast. I&apos;m missing her being a baby because she will never be that little girl any more. But it is so exciting and incredible to see her grow in to this amazing lady. It is such a crazy feeling. Oh, and the fact that she will never know exactly HOW MUCH I LOVE HER! Alysha Nett: And what is the best thing? 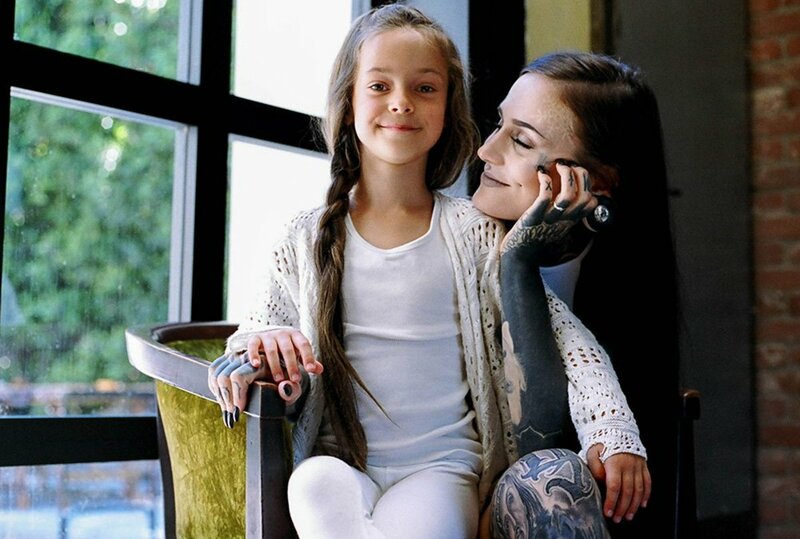 Monami Frost: Seeing her smile and giving her love. Just being her mother—seeing a part of you grow in to this amazing person! Alysha Nett: Let’s talk about your Youtube channel a bit. How long have you been making videos? Monami Frost: It has been 1 and a half years already! It is so crazy how fast the time flies. I absolutely love filming and editing videos and including my daughter and husband. The best part is that people can get to know me and see that I am just this young mom who loves her family, loves cooking and loves art. Alysha Nett: Which ones are your favorites to make? 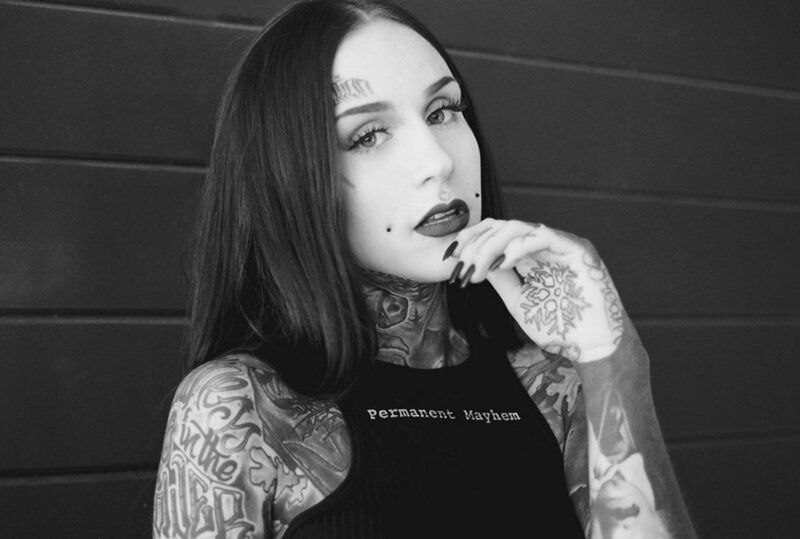 Monami Frost: Definitely the ones with my daughter and the ones where I talk about the things that I love and tell stories and, of course, cooking. So, basically all my videos! Alysha Nett: I really love the ones with your daughter. I think its pretty cool that you’re raising a vegan child. Is that challenging to do? Monami Frost: Thank you so much! Sharing the same values and love for animals, health, environment is actually the easiest and best thing ever! It’s not hard for kids to understand what&apos;s right and what&apos;s wrong. Alysha Nett: Does she ever ask to try other types of food? Monami Frost: Never! The first thing she asks when curious about foods is, "Is it vegan? Does it come from animals?" And when she finds out it’s not, she makes it clear, “On noo! I don’t want to eat that!” She doesn’t see it as food, like how other people don’t see—for example—dirt or dog meat as food. I love seeing how passionated she is about health and food and Veganism. Alysha Nett: Shifting gears again… your tattoos. Wow, you have a lot. I’m obsessed with the snowflake on your forehead! How many snowflakes do you have? Monami Frost: I absolutely love it as well! Now I have only four, but will definitely get more! Snowflakes take my breath away! Alysha Nett: How long have you been filling in your black arm and what was under it to begin with? Monami Frost: It only took about six-seven sessions in total including portraits. Under the black there were some of my first tattoos and a couple of them where tattoos that I had tattooed myself on myself, haha. I love my black arm. It’s still one of my favorite tattoos on my body. 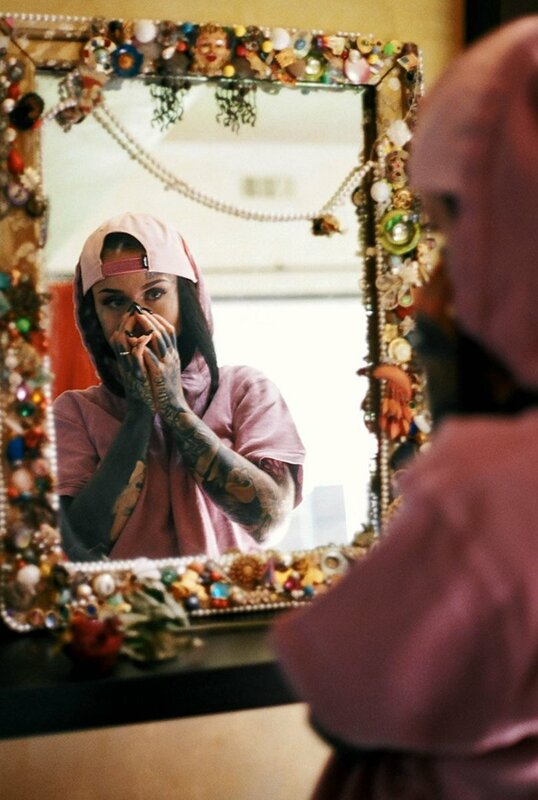 Alysha Nett: Are you going to one specific artist? Monami Frost: Pretty much all of the tattoos are done by my husband Anrijs Straume. I feel like I am his painting in progress. But I still have a couple of tattoos I did my self on my legs. I&apos;m so lucky that my favourite tattoo style is exactly what my husband is great at! 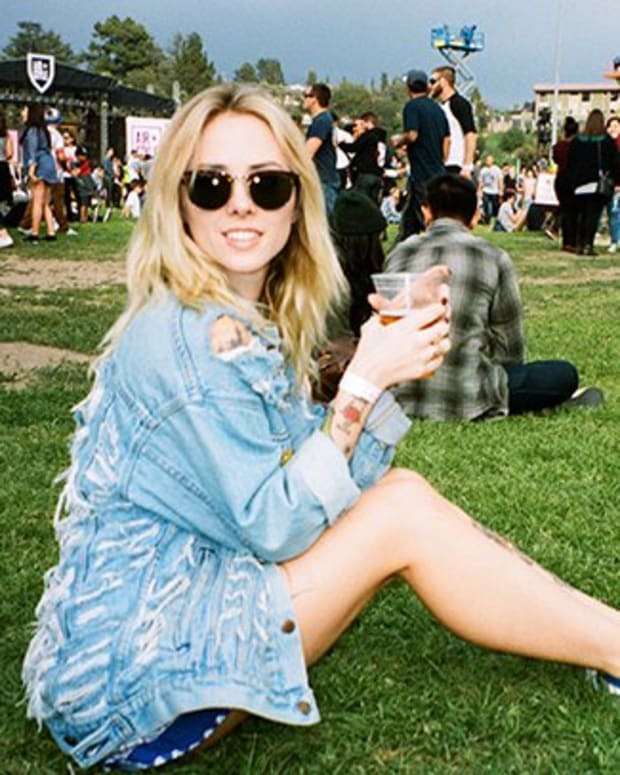 Alysha Nett: Any plans to get a souvenir tattoo while in Cali? Monami Frost: No. Like I said my canvas is just for my husband and I love having tattoos from one artist. I feel that you can see how well it flows together because of it.